Florence Aby Blanchfield was born on 1 April 1884 in Shepherdstown, WV, one of eight children of Joseph and Mary Anderson Blanchfield. Her goal to become a nurse was achieved in 1906, when she graduated from Southside Hospital Training School for Nurses in Pittsburgh, PA.
Blanchfield's early employment history includes positions in private duty nursing, hospital nursing in Pennsylvania and the Panama Canal Zone, and industrial nursing for the U.S. Steel Corporation. In 1917, she joined the Army Nurse Corps, left for France with Base Hospital #27, and served as Acting Chief Nurse of Camp Hospital #15. Following separation from the military in 1919, Blanchfield returned to Pennsylvania for a brief period and re-entered the Army Nurse Corps in 1920. Over the next fifteen years, Blanchfield completed assignments across the U.S., and in the Philippines and China. In 1935, she joined the U.S. 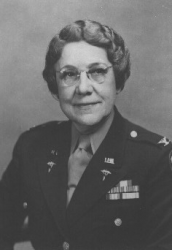 Surgeon General's staff in Washington, DC, and was named Superintendent of the Army Nurse Corps in 1943. World War II generated a critical need for nurses and under the leadership of Blanchfield, the Corps was expanded from approximately 1,000 to a force of 57,000 nurses. In recognition of her devotion and contributions, she was awarded the Distinguished Service Medal in 1945. Although Blanchfield successively held the ranks of First Lieutenant (1920), Captain (1939), and Lieutenant Colonel (1942), those ranks were relative in nature. Nurses were denied the rights, privileges, and pay enjoyed by male commissioned officers. Appalled by this inequity, Blanchfield struggled to achieve full military rank for nurses. In 1947, the Army-Navy Nurse Act authorized placement of the Army Nurse Corps in the Regular Army with equal pay and privileges for commissioned nurses. 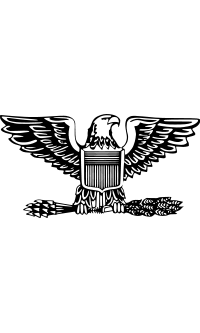 On 18 July 1947, Blanchfield was commissioned as a Lieutenant Colonel in the Regular Army by General Dwight D. Eisenhower. She retired as a Colonel in the U.S. Army. In 1951, she received the Florence Nightingale Medal of the International Red Cross for her service to humanity. As a final tribute to this extraordinary nurse, the Colonel Florence A. Blanchfield Army Community Hospital at Fort Campbell, KY, was named in her honor and dedicated in September, 1982. Following her retirement in 1947, Blanchfield remained active as a consultant and author. She promoted the establishment of specialized courses of study and influenced the development of a program in nursing administration for Army nurses. Colonel Florence Aby Blanchfield died on 12 May 1971. She was buried with full military honors at Arlington National Cemetery in Arlington, VA.